Female Transformation Of The Week - Michele Wile. Michele Wile made an amazing transformation, losing nearly 77 pounds. She has since won the Texas Shredder Classic in the novice short class! Find out how she did it here! I was fat. 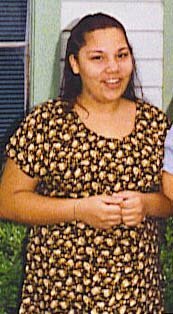 Not chubby, not pleasantly plump, not voluptuous, nor big-boned-I was fat. Growing up, my family celebrated everything by eating traditional Mexican fare. On Christmas there were tamales and menudo. On my birthday I would eat my Mom&apos;s homemade enchiladas, every Saturday morning I ate my grandmother&apos;s tortillas made with lard that was heaped out of a 5-pound yellow box with a smiling pig&apos;s face. It was no wonder I was relentlessly teased and picked on as a kid! When I began high school I stood at 5-feet tall and weighed 180 pounds. I was called names like Shamu, fat girl and oompalumpa. For a teenager trying to find her identity it was miserable. Throughout high school I mostly kept to myself and joined the ranks of the "band nerds" where I found friends and discovered my talent for playing the French horn. I gazed upon the petite skinny cheerleader-types and longed to be thin. Needless to say, I never had any male admirers and this made me slip into a deep depression. I had no idea how to lose weight or exercise. My typical diet would consist of 2 McDonald&apos;s bacon, egg and cheese biscuits, a hash brown, and a large orange juice for breakfast. After marching band practice I would drink a super big gulp filled with Sprite or Dr. Pepper instead of water. Lunch could be 2 hot pockets and a king sized snickers, a foot-long meatball sub or Chinese food. For dinner my dad would fry chicken and make mashed potatoes and gravy. I tried all kinds of weight loss diets, vegetarian, Slim Fast, the cabbage soup diet, if it was popular I was on it. I did manage to lose some weight. When I graduated from high school and throughout college I weighed on average between 130-140 pounds. Losing 40 pounds should seem like a victory, but not when I had the muscle tone of an egg salad sandwich. [ Click here to learn more. ] Cabbage Soup Diet! No one knows where the cabbage soup diet originated even though it has been written about by a fair number of authors already. Learn what the diet consists of. I desperately wanted to lose weight, so I joined the Marine Corps. The Marines got me into shape! Before I knew it I was maxing out the Physical Fitness Test. I could run 3 miles in 20:45, do 100 sit-ups in 2 minutes and do a 70-second flexed arm hang. Even though I weighed 125 pounds and was a running machine I looked overweight. I was still so frustrated with my body. How could I be capable of maxing out a PFT, but look overweight? This made my depression even worse. I began to drink and eat my problems away. After the Marines I met my husband Barry who accepted me for the way I was. I hated looking in the mirror and I would often take out my insecurities on him. Finally, in 2002 I was fed up with my body and depression. I got a job at a gym determined to lose weight and change my body. I hooked up with an experienced trainer and bodybuilder who showed me how to exercise properly and balance cardio with weight training. He also taught me what the term "eat right" means. I went home one day and threw out all of the food in my kitchen. I decided to start over. The weight loss did not happen over night, but I stayed determined and never looked back at my old eating habits. As I stayed consistent with my new diet and training routine my weight decreased, my self confidence increased, as did an enormous amount of excess skin on my stomach. By 2003 weighed 119 pounds and I had lost so much weight and reshaped my body so dramatically that I had to have 6 inches of loose skin removed from hip to hip. From 2003-2007, I continued to work out 5-6 days per week and maintained my physique. Feeling as though I had hit a plateau, I was no longer satisfied with being just in shape. In January 2007 I decided I wanted to get on stage. That is when I met Dave Goodin, 3-Time Pro Natural Mr. Universe at Hyde Park Gym in Austin, Texas. He took me from being in shape to being inside the winner&apos;s circle. Dave modified my weight training program and reduced the number of calories in my diet. [ Click here to learn more. ] An Interview With Dave Goodin! Dave Goodin is a 3-time WNBF world&apos;s winner and the top money winner in natural bodybuilding history. I immediately began to see results. This was the hardest test of physical strength I have ever endured. I got up every morning at 4:30 and went for a 40-60 minute jog. After work I went to the gym, weight-trained and did 30 more minutes of cardio. I ate only complex carbohydrates such as sweet potatoes, oatmeal, apples and green veggies. My protein sources were chicken breast, whiting, and protein shakes. I was hungry and tired, but those feelings soon dissipated as my body adjusted to the new program. After about a month people began to notice my transformation and I was pumped! Dave was always there encouraging me and telling me I was on the right track even though I could not see it. I had no idea what "ready for a show" was supposed to look like. I had no idea how a competition diet would affect my moods and body. I trusted Dave to tell me how I was progressing and what was normal. All I know is that every time I went to the gym people would give me compliments and motivation, especially my husband Barry. He saw me through bad moods, fatigue and self-doubt. When I thought I couldn&apos;t go on he pushed me forward and told me "get up and do it. You have come too far to quit." 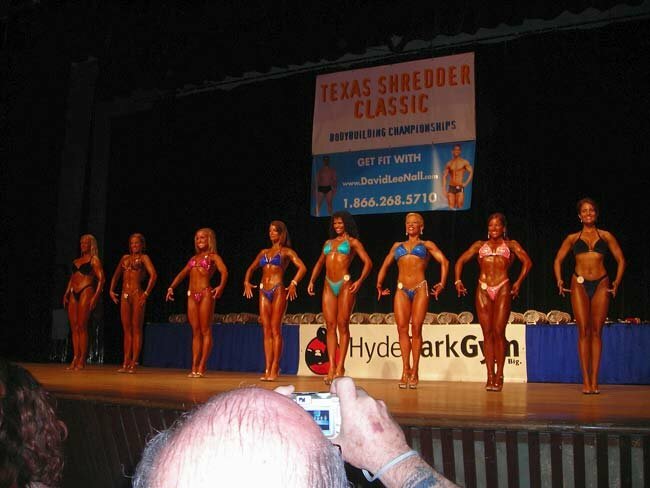 On May 5, 2007 at the Texas Shredder Classic in Austin, Texas, I stepped on stage in front of the bright lights and cheering crowd, and I was not the least bit nervous. Thoughts of sore muscles, hunger pangs, early morning cardio sessions and walking around the house in 6-inch clear plastic heels just evaporated. 2007 OCB Texas Shredder Classic - Novice Short Class. This moment was all worth it. I wanted to show off my hard work. I wanted to shine! It was exhilarating! After I accepted my first-place win and went off stage the first person I saw was my wonderful husband. He gave me a beautiful bouquet of flowers and said, "Congratulations champ. I knew you could do it." Dave taught me that if you are as strong as possible you will succeed. You are in control of your body and your attitude. If I can lose weight and become a winner then you can too! Losing weight, changing your outward appearance, or even winning a competition is not about the destination. The journey is the most important part of the road to success. In my journey I faced many painful memories and overcame many obstacles both physical and emotional. I heard the mean words that people uttered in my head, and I take pride in knowing that I did not allow my self to be defined by their small minded view of my capabilities. I have come to the realization that success and failure have one thing in common; they are both fleeting and can be changed at anytime. Click Here For A Printable Log Of Day 5. Click Here For A Printable Log Of Day 6. Click Here For A Printable Log Of Day 7. Click Here For A Printable Log Of Everyday.